Give us all the chocolate, please!!!! Anyone else feel like a rock star Monday and Tuesday because we’ve been killin’ it in the gym and sticking to our diet plan, but then all of a sudden Wednesday rolls around and all you think about is chocolate. Anyone? Yes, No, Maybe So… It is okay to not want to admit to the cravings that leave you hankering for something chocolate or sweet. We have all certainly been there at one point in time or another. It is these exact moments that we just needed a better answer than reaching for a pint of ice cream and polishing it all off. Even if it was one of the most lower in calorie ice creams that are marketed as being super healthy, they are still too high in sugar for us. 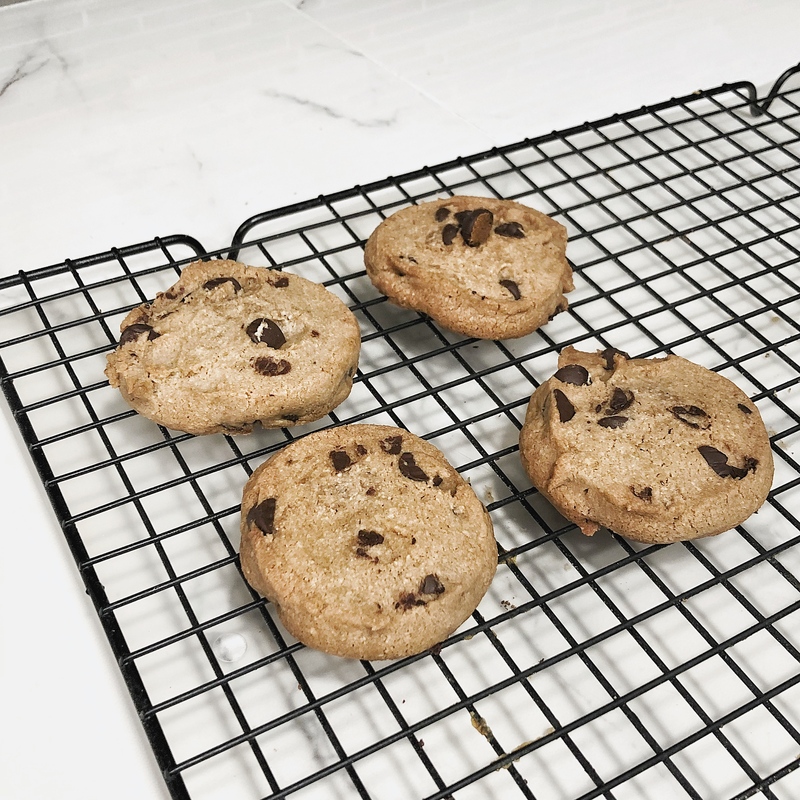 We searched high and low for a chocolate chip cookie recipe that was low in sugar and calories yet curbed our sweet tooth and found a winner. This is a chocolate chip cookie recipe that also happens to be keto friendly, gluten free but not vegan because of the eggs. With a hand mixer and a medium-sized bowl, mix together coconut oil and butter. Then add eggs and vanilla extract and continue to mix. Next add the monk fruit sweetener, baking soda, cream of tartar, and salt. Keep mixing with the hand mixer until well-combined. Slowly add almond flour while you keep mixing with the hand mixer. Pour chocolate pieces into the bowl of dough and fold in until combined. Form dough into small balls and lightly press down to flatten then place on cookie sheets. Keep a couple inches of space between cookies. Bake cookies for 18-20 minutes or until edges are golden brown. Remove the cookies from the oven and allow to cool before serving. Celebrating National Cookie Dough Day the EBOOST way.